Yesterday Milla and I went to see the Tall Stories production of The Gruffalo Live on Stage. My memories of childhood theatre trips are tinged with excitement and magic so I am keen to bring some of the same wonder to the early experiences of my children. As soon as I saw The Gruffalo advertised I knew we had to go! After a quick run down the street (darn that clock change!) we entered the Theatre Royal Winchester where bird song rang out around ‘deep dark wood’. The set was a simple forest backdrop which set the scene but was sufficiently muted that it blended into the background once the play began. 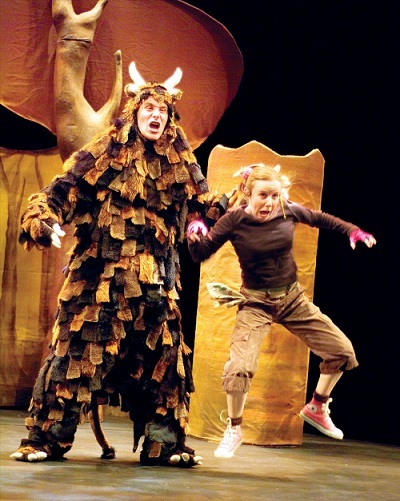 The cast was made up of three actors, a mouse and two narrators who take on different roles; one the predators and the other the Gruffalo himself. The costumes were all based over a basic t-shirt and combats combo which was then dressed up for the changing characters (a tweedy East-end fox, an aviator owl and a sparkly South American snake).Â The mouse had the least obvious costume (pictured above) although it was made clear who she was in the opening scene. The production contains plenty of songs, laughs and best of all shouting out. Milla (33 months) happily sat through the whole show and from what we saw the other audience members were equally entranced. I would say it works well for its pitched audience of 3+ as well as being fun for those a little younger. So what did our pint sized reviewer have to say on the subject? She loved it: the songs were fun, it wasn’t too scary and she got a sticker – can’t get better than that! I’m not sure it was quite what I expected but it was nonetheless a great morning out and well worth the ticket price.